Andrews, Frank DeWette (1847-1937), was born on August 1, 1847 in Southington, Hartford County, Connecticut, the son of Bennet Josiah Andrews (1806-1860) and Lavinia Frost (1817-1899). 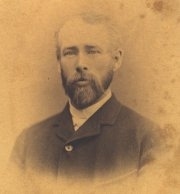 He was a descendant of John Andrews an original proprietor of Farmington in 1640. As a young boy Andrews developed what would grow into a life-long avid interest in geology, genealogy, numismatics, philatelics, antiquarian history and Indian relics. Fig. Ebenezer Locke Mason, Jr., correspondence with Frank DeWette Andrews July 6, 1867. Courtesy Lupia Numismatic Library. According to the 1870 U. S. Census the family owned and worked a prosperous estate farm and Andrews personal estate was valued at $4,000. While farming in Southington, Andrews married Kittie Gallup (1842-1880) on December 16, 1868. In 1869 he and his family moved to South 7th Street, in what was then called Landis Township, Cumberland County, New Jersey. "I will say here, that, for the want of something to closely occupy and engage the mind, I attempted the work upon the United States cents 1816-57 . . . There is nothing . . . to enable one to endure sorrow as constant occupation, which shall keep the mind from dwelling upon its loss." The scarcity of copies drove up the price of this fifty-four page pamphlet and by 1884 we find a record that it realized a price of $4.00 at public auction. His numismatic interests also led him to become a corresponding member of the ANS since June 12, 1883. During this time he lived with his twice-widowed mother Lavinia A. Norton and his elder widowed sister Emma Belinda Gridley at his home in Vineland, New Jersey. It was at his home in Vineland that Andrews found himself publishing a revised edition of his original 1881 pamphlet on United States cents. Andrews’ second book on Large Cents, An Arrangement of United States Copper Cents 1816-1857, for the Assistance of Collectors (Vineland, N. J., 1883), printed in forty-two pages is given its first public notice in March 1883. In November 1884, Mason advertised it as being sold for only $0.40. In March of 1885 it was once again being sold for $0.50. Several years later, he became a Trustee of the Vineland Historical and Antiquarian Society in 1888. Two years later, he married Rebecca “Bessie” Graham Ayars (1849-1921) on April 10, 1890 at Greenwich, New Jersey. About this time he began to assist in land acquisition for the Library building of the Vineland Historical and Antiquarian Society, which he endowed. By July 1894 the small building housed a collection of curiosities and relics as well as books and documents. From 1890 he worked, without compensation, as the Librarian for the Vineland Historical and Antiquarian Society, and that same year became secretary and treasurer. The 1900 – 1920 U. S. Census reports list him living with his second wife and his sister Emma at his home in Vineland, New Jersey. He published dozens of books, pamphlets and articles through the Society and later on in 1916 through their organ publication The Vineland Historical Magazine. These works were mainly genealogical essays and biographies derived from antique documents, autograph letters, rare Americana, tax records and gravestones and included such titles as : Thomas B. Braidwood, Born 1818, Died 1906 (1909) A Journey From New York to Montreal by way of Saratoga Springs and Niagara Falls in the Year 1824 : Printed From the Original Manuscripts in the Possession of Frank D. Andrews (1912); Names of Tax Payers of Hingham, Massachusetts, 1711 : From Original Manuscripts in the Possession of Frank D. Andrews (1913), to mention a few examples. In 1931 an addition was built onto the Vineland Historical Society Library containing “Andrews Room”. In 1932 a stately portrait of Andrews was painted by August Franceschi. He continued as Editor-in-Chief of the Vineland Historical Magazine up until his death at Philadelphia on January 28, 1937. “Our Bargain Department,” Mason’s Coin Collectors’ Magazine, Vol. 1, No. 6, November (1884) : 72. This lower price might have been a typesetters error and was missed in the galley proof.